Do different age groups prefer different online content? Yes, they do. There is no single universal marketing strategy that could work for everyone. A 50 year-old non-techno person would have an entirely different reaction to an online advertisement as compared to a person in his late teens. That’s why it is impossible to run a successful online content marketing campaign unless you have segmented your audience in age groups. Segmentation is vital because it helps you identify your target market. Otherwise, you will have no idea whom you are addressing. In generational marketing, the audience is segmented on the basis of the generation they belong to. Each generation refers to a group of people born in the same period of time who share similar life experiences and are shaped by that particular time period. For generational marketing, you must modify and customize your online content with respect to your target generation. You will find six living generations in the USA who are quite diverse from each other when it comes to interests, hobbies, mental approach, and just about everything. Most marketers base their generational marketing strategy on at least four out of these six generations. Exceptions are always there, as a person’s age can’t always tell his preferences and attributes, but as a general rule, you will find each group to share many similarities. According to research conducted by Fractl, every generation has an almost equal number of similarities and differences regarding the consumption habits and preferences for digital and online content. As a marketer, it is important to recognize the behavior of multiple generations and to modernize your marketing strategy if needed. It allows marketers to target an audience on the basis of their similarities and dissimilarities. Understanding each generation and their preferences is extremely important for the success of generational marketing. Let’s take a brief look at all the six generations. Born between 1901 and 1926, this is the oldest living generation in the USA currently. This generation is generally conservative-minded with little to no knowledge about digital media, and thus not often included in generational marketing. This is the generation that was born between 1927 and 1945. Like the GI generation, this one also shares a conservative mindset but at a comparatively lesser level. The people of this generation enjoy reading newspapers for staying up to date. They are also not commonly selected for generational marketing. Baby boomers, or the “me” generation, were born between 1946 and 1964. This is the generation that is slowly embracing the use of modern technology but still can’t let go of voicemails. They are quite open to direct marketing tactics. This is the smallest generation of them all and is often called the bridge between Baby Boomers and Millennials. They have seen TV take over radio. They are much more social media-savvy than Baby Boomers. Reportedly, more than 80 percent of this group use Facebook, Twitter, and MySpace. Although they aren’t very accustomed to online marketing, they are happily showing their approval for this idea. Born between 1981 and 1999, this generation is talked about frequently on social media and in popular culture. Millennials are gradually outnumbering the baby boomers at workplaces and are known to be the biggest generation of entrepreneurs. Millennials value satisfaction more than financial security. As per Brooklyn Institute, around 64 percent of Generation Y members prefer making $40,000 per year at their favorite job than making $100,000 at a job they think is not attractive. Millennials are the current economic force of the society with their buying power of 200 billion dollars. This is the generation that is most receptive to online purchasing and often the key target of generational marketing. Therefore, they like taking informed decisions about any purchase. They seek recommendations from family and friends, read online reviews, check ratings, and then make a decision. The percentage of individuals aged between 18 and 29 that use social media is 86 percent. The percentage of individuals aged between 30 and 49 that use social media is 80 percent. The percentage of individuals aged between 50 and 64 that use social media is 64 percent. The percentage of individuals aged 65 and above that use social media is 34 percent. Facebook is the most-used social media platform by all age groups. Almost 88 percent of 18 to 29 year-olds, 79 percent of 30 to 49 year-olds, 61 percent of 50 to 64 year-olds, and 36 percent of people 65 years old and above use Facebook. Instagram turned out to be most popular among young people with percentages of 59 percent for 18 to 29 year-olds, 31 percent of 30 to 49 year-olds, 13 percent of 50 to 64 year-olds, and only five percent of those 65 years old and above. Twitter is moderately followed by all age groups with percentages of 36 percent for 18 to 29 year-olds, 22 percent of 30 to 49 year-olds, 18 percent of 50 to 64 year-olds, and six percent of those 65 years old and above. The percentage of 18 to 29 year-olds interested in the news is 59 percent, with one in four likely to go in-depth. The percentage of 30 to 39 year-olds interested in the news is 75 percent, with one-third likely to go in-depth. The percentage of 40 to 59 year-olds interested in the news is 77 percent, with 43 percent likely to go in-depth. The percentage of 60-plus year-olds interested in the news is 89 percent, with 54 percent likely to go in-depth. 18 to 29 year-olds are most interested in news related to the environment, business, crime, health, and social issues. 30 to 39 year-olds are most interested in news related to the environment, their local town, national politics, business, crime, foreign issues, and science and technology. 40 to 59 year-olds are most interested in news related to the environment, the local town, politics, business, health, and education. 60-plus year-olds are most interested in the environment, the local town, national politics, economy, crime health, and education. As per The New York Times, people aged 50 and above watch more than 50 hours of TV a week. People aged 25 to 34 years old watch 26.5 hours of TV per week, and people aged 35 to 49 watch 36.5 hours of TV per week. Baby Boomers actively consume digital and online content which makes them easy to reach through content marketing. But here is the catch: Even as content marketing becomes more responsive and mobile-based, Baby Boomers prefer desktops. More than 80 percent of baby boomers favor desktop computers and laptops over smartphones. Almost 25 percent spend more than 20 hours per week going through online content. They also consume 94.7 percent more global news than millennials, making news stories a key source to reach them. Most Active: Between five a.m. and noon. Generation X, due to their thin numbers, is not actively targeted by marketers, but here are a few habits to keep in mind when marketing to this age group. They enjoy online content related to entertainment and lifestyle and use both desktop and tablet, but prefer desktop and laptops. Most Active: In the evening, from eight p.m. to midnight. This is the largest living generation, with over 75.4 million members, and often a prime target of marketers. Unlike the above two generations, this age group is more mobile-friendly, so your marketing strategy must be responsive. They prefer brief online content. Most Active: In the evening. If you are targeting this age group, your marketing strategy must be based on mobile devices. They spend more time (15.4 hours) using smartphones per week, more than any other age group. With an ability to influence what their parents buy, growing number of marketers target this group. When it comes to frequent content consumption, the six generations have a lot of similarities, despite their differences in other cases. Therefore, using the content preferred by all age groups will cover a larger audience. Blog posts are the most popular content among the three most-targeted age groups. All age groups prefer shorter and precise articles with approximately 300 words, but recent trends show acceptance of longer, more in-depth content. Approximately 20 percent of Gen-Xers prefer reading content that has more than 500 words. More than 50 percent of Baby Boomers prefer content with fewer than 300 words. The remaining 50 percent go even lower than that and prefer less than 200 words. This does not necessarily mean that you always have to write exactly 300 words. Just make sure that your content is clear, concise, well-written, and resonates with the audience. 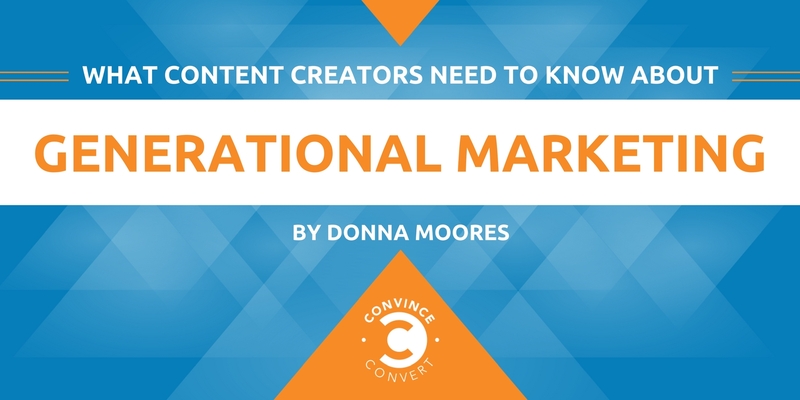 As Ann Handley said, “Just as your content needs to target customers at every step of their journey with you, it also needs to appeal to their rational and emotional sides. Every customer needs to have their interest piqued, engagement provoked, and confidence built.” Therefore, generational marketing is all about connecting with your audience at a deeper level by going through means they are attached to. Facebook: A lot of Baby Boomers are now using Facebook. Sponsored ads with relevant information targeting them are a good way of catching their eye. Content: They prefer and read high-quality blog articles, reviews, ebooks, and comments. To target baby boomers, produce and publish high-quality text content, as they are willing to read. Slow Videos: Videos that are slow in pace and contain detailed information are a good way to target this generation. Email: Baby Boomers are avid users of email, so running email content campaigns will be fruitful for you. Discount Coupons: Baby boomers prefer saving money when they get a chance. Therefore, you can market discount coupons for effectively reaching them. If you are targeting Generation X, following the tips below can help you improve the results of your marketing campaign. Facebook: The number of active Facebook users among this generation is much higher than Baby Boomers. Facebook ads are going to get a lot of response. Email: This medium is highly preferred by Generation X. Do not miss email marketing while targeting this generation. Twitter: Unlike Baby Boomers, Generation X is familiar with Twitter. And they’re not just familiar—there are around five million regular users of Twitter among this generation. It’s up to you how you make the most of it. Blogs: Generating valuable content can give you a very high ROI when it’s about Generation X. Keep the content clear, easily comprehensible, and to-the-point. Focus on the customer’s benefits. Millennials bring you the most business. Here’s how you can maximize your marketing efforts for this age group. Social Media: It goes without saying that this generation is extremely tech-savvy. When it comes to social media, you will find this generation to be extremely active. That isn’t just limited to Facebook, but to all the contemporary social media sites and apps. Mobile and SMS Marketing: This generation is all about smartphones, making mobile marketing essential to reach millennials. Video Marketing: Video marketing is a revolutionary channel. Real-time videos are a popular trend these days among millennials, which means you can use Snapchat and other such platforms for addressing this generation. UGC: User-generated content such as blogs, chats, tweets, digital images, audio, and others are a good way of grabbing millennials’ interest. This generation has just started spending time online. They also influence the buying decisions of their parents, which is why you can no more ignore Generation Z when marketing your products. Social Media: This goes without saying. Platforms like Facebook, Twitter, Snapchat, and other related apps should be your major communication medium to reach this demographic. Short Videos: You can use very short videos or GIFs to deliver your message to Generation Z.
Quizzes: This generation is highly receptive to online quizzes and surveys. You can use this to your advantage for finding out their demands and needs. Memes: This generation loves sharing memes that interest them. You can use them as a marketing tool to reach them. Imagery: This is the generation that has been brought up seeing DSLRs and fancy cameras all around, so they are naturally attracted to eye-catching imagery. You can use photographs as a medium to reach them through Instagram or other social media platforms. Creating content for different generations is no cakewalk, considering their extremely diverse ideas and values. However, with the constantly growing channels and generations’ adaptability towards them, you can create the content that will help you create a deeper association with your audience. A version of this post originally appeared on the HandMadeWritings blog. 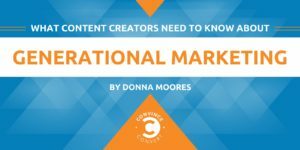 Donna Moores is a professional blogger and a content writer. She has gained an outstanding marketing experience within the biggest industries and businesses, which she pleasantly shares with the readers. Drop her a line via e-mail and check out her Professional Blog.